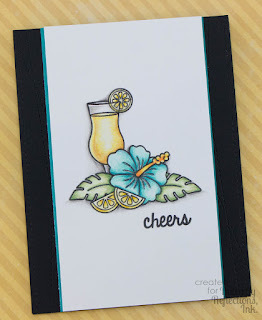 I am so excited to be back to share a few card with you all! I gotta be honest peeps, I love how my card turned out, but not a big fan of my pictures. In fact, I was getting ready to do new ones, when I realized there was water allll over my craft room floor. Ruh-ro Raggy. So. No new pics, but it's cool, I hope you enjoy my cards anyway! For my cards today, I used the Sunny Studio Stamps Tropical Paradise Stamp Set. I simply adore the shape of these images. The first thing I did was, I made masks of all the images with Inkadinkado Stamping Mask Paper, then stamped my scenes with Momento Tuxedo Black Ink on all of my cards. On my first card, I decided I wanted to use colors, that I normally wouldn't. Ya know, so I could color teal flamingos. Really, I grabbed an old color wheel I have and chose Copic colors that worked together. When all of my images were colored, I masked everything off again. Then, on the top half of the panel, I added a light layer of Ranger Distress Ink in Wild Honey with a Mini Ink Blending Tool. I kept my masks in place and using the same ink I placed the My Favorite Things One Way Chevron Stencil and when over it again. The bottom half, I used Mowed Lawn and Twisted Citron. I used the same Stencil on a Lawn Fawn Black Licorice Cardstock Card Base and some vellum with Versamark Ink. 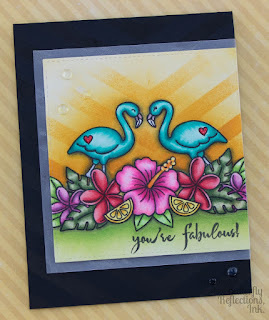 The sentiment is from the Hero Arts Color Layering Flamingo Stamp Set and to finish it off I used some Nuvo Crystal Drops for embellies. 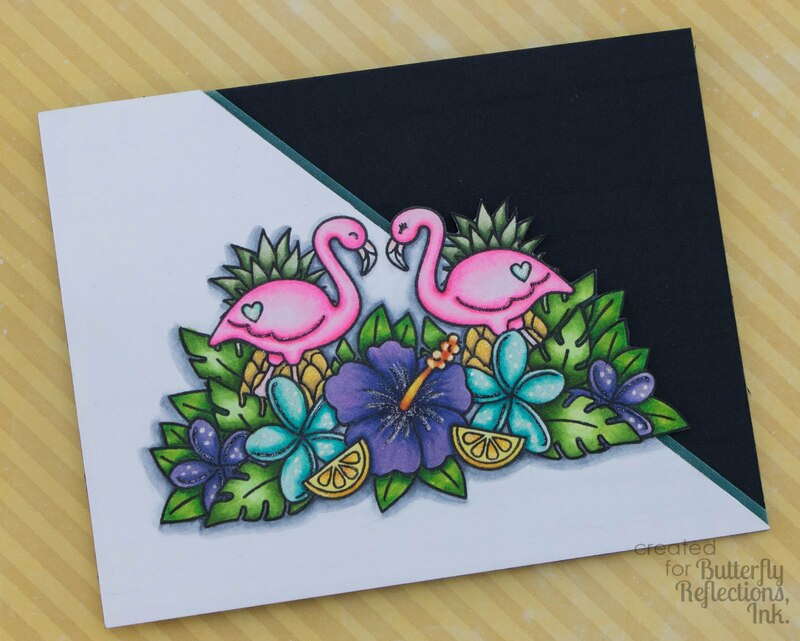 My second card has pretty much the same layout as the first, but I added the pineapple stamp behind the flamingos and kept the colors much more traditional. I decided not to do any ink blending or add embellishments on this. Instead, I used a silver-y glitter gel pen to add some details and called it a day. You could also use a white gel pen like the Uni-ball Signo White Gel Pen. For my last card, I changed it up a bit. This time, I stamped my images on some Tim Holtz Distress Watercolor Cardstock, but instead of watercoloring, I used colored pencils. You could used any brand you like. If I were to do this again, I would definitely go for some coloring with Zig Clean Color Real Brush Markers. Again, I used some Lawn Fawn Black Licorice Card Stock for my card base, but before I attached the panel, I used the My Favorite Things Die-Namics Stitched Strip Die on the card base. To finish off my card, I added some Spectrum Noir Clear Glitter Pen to the highlights of the images. That's it! Thanks so much for stopping in to see me today and as always, I hope you enjoyed my cards today!